Home › Blog › How in the World has the UFC not offered a refund for UFC 187? How in the World has the UFC not offered a refund for UFC 187? Here we are, two weeks removed from the announcement of Jon Jones’s suspension and removal from the UFC 187 main event, and still not a word about refunds being offered to the consumer. The name of the event was UFC 187: Jones vs. Johnson. Not Cormier vs. Johnson. Not Weidman vs. Belfort. It was Jones vs. Johnson. To act as if Jones is just another competitor on the card is an insult to the consumer’s intelligence. Are there tons of Jon Jones haters? You bet. But there are also legions of fans who if nothing else, respect him for being the #1 P4P fighter on the planet. So when you remove the top P4P fighter in the world from the main event by your choice, not by circumstances beyond your control, wouldn’t you have to be aware that there will be many people who feel cheated? Therefore, to ignore this obvious predicament and not address it at all is not only an insult to the consumer’s intelligence, it is bad business ethics, and most importantly, it sets a very dangerous precedent that we cannot accept. What Jon Jones did is inexcusable. I am not defending his actions nor am I condoning it or even tolerating it. However, the reality of it is, there was nothing legally stopping him from competing whether it be by the law or by the state athletic commission. Had tickets not gone on sell yet, then I would have no issue with cancelling the fight and doing whatever else is necessary to send a message to Jon Jones and the rest of the world about what the UFC will and will not condone. But once the tickets have gone on sell and consumers have paid to see the card, you have to know that many of those people paid specifically to see Jon Jones. Jon Jones is not the biggest draw in the UFC; but according to the P4P rankings, he was its best fighter. Let’s be clear: To contradict Dana White, Jon Jones was not “on his way to being one of the greatest ever,” he is already one of the greatest ever. What he was on his way to becoming was the undisputed greatest ever in terms of achievements if nothing else. And to remove this attraction from the card is more than “sending a message,” and it surely is not business as usual. It is a statement that the company wants to make. Which is fine. It’s their company, they can send whatever message they want, how they want. But when there are prior commitments to outside parties involved, such as consumers who paid to see Jon Jones, wouldn’t it seem that the right thing to do would be to offer these fans a refund? Main events are cancelled or changed all the time. Injuries happen far too regularly and there is no control over that. If the UFC offered a refund for every time there was a change in a main event due to injury, that would not be philanthropic or ethical, it would be bad business. This is where “Card Subject to Change” is enacted. But when the change was 100% optional and within the control of the organization, and after tickets have already been purchased prior to the change, that is when it becomes outrageous to not offer a refund. Prior to Jones’s suspension, there were many people: fans, fighters, and certainly the media who wanted Jones pulled from the card and disciplined harshly. Most of these people, especially the media, have no stake in the situation. It is easy for these people to say these things when they did not pay to see Jon Jones. It is easy for Kenny Florian to suggest pulling him when he does not pay to watch the fights, he is paid to watch the fights. It is easy for Joe Schmo at Yahoo News to say what should happen to Jon Jones when chances are: he is either not a diehard MMA fan or not a Jon Jones fan. It’s an entirely different scenario when someone has already paid his hard-earned money to see THE marquee fighter, and this fighter is removed strictly by choice of the promotion! Let’s put this in terms everyone can understand. Take Mayweather vs. Pacquiao for instance. Suppose after tickets went on sale, Mayweather was arrested for domestic violence. Then, bail is posted and traveling restrictions have been lifted (Mayweather lives in Nevada but you get my point) and there is no administrative body that is preventing Mayweather from fighting. Are you telling me that if Mayweather was disciplined by Showtime and/or whatever agency that has control of his appearance pulled him from the fight and then replaced him with another great fighter, let’s say, Timothy Bradley….are you telling me that ticket holders would not be refunded? Sure, there will still be a pay per view, and there will still be a great main event, but if you paid to see Mayweather and/or if you paid to see Mayweather vs. Pacquiao, and you CHOOSE to suspend Mayweather and replace him with someone else, are you telling Tom Brady, Denzel Washington, and all these A-listers, not to mention every single fan in attendance, “Sorry, card is subject to change.” The very idea of that is impossible to imagine because it is not grounded in any logic whatsoever. I submit to you ladies and gentlemen, that this hypothetical scenario is EXACTLY what has happened with Jones vs. Johnson, and it is just as unacceptable as if it were to have happened with Mayweather/ Pacquiao. So what do you do, then? One might ask. Do you do nothing? Just let Jones continue to make a train wreck of his life and embarrass the company? Just leave everything to the police? Well, although Chael Sonnen put it best by saying that there are bodies in place to deal with matters such as this and the UFC should stick to the fight business, I feel that if the UFC wants to run its business a certain way, whether it be PR motivated or not, that is their business. 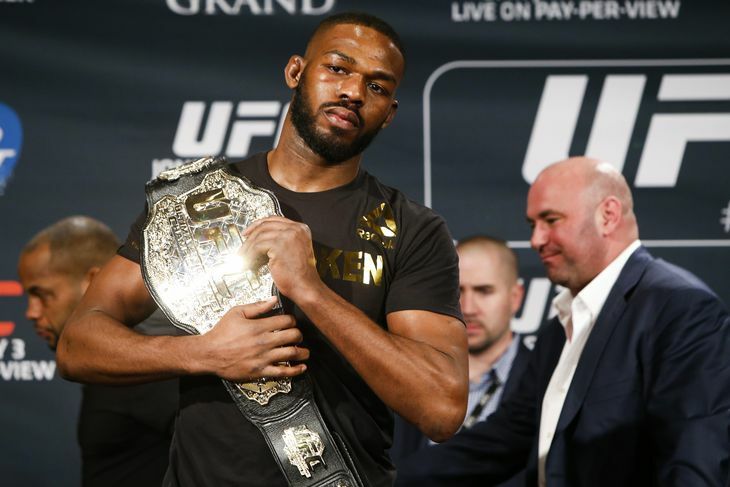 But after tickets to see Jones have been purchased, what I feel would have been the right thing to do would be to release a statement that says that the UFC 187 main event will go on as scheduled and that discipline for Jon Jones will be determined after contractual obligations have been met with the consumers who paid to see UFC 187. So by placing the consumer first, you save face. You pretty much say, “Hey, we’re not condoning what he did, and we know this is not the first time he’s done something unacceptable, but people have already paid to see this fight, the least we can do is honor the card and deal with him afterwards.” To not do this, once again, THAT’S FINE. You want to suspend Jones immediately, THAT’S FINE. But the same way Jones’s choices have consequences, so should the promotion’s. There should be no double standard. You have your code of conduct, ethics, and beliefs, GREAT. But like anyone else, you have to sacrifice for them. You want to suspend Jones and cancel the main event, then make the SACRIFICE of doing the right thing and offering the fans a refund! And if so many people really did want Jones suspended, then it wouldn’t affect your sales at all, because those people would still go see the show! Did the UFC ram into a pregnant woman’s vehicle and leave her to fend for herself in the middle of the street? No they did not. But they still made a decision, and to not sacrifice anything for this decision is to have their cake and eat it, too. In essence, if we are running a business that wants to send the right message and do the right thing, then let’s do the right thing all around. Let’s not just do the right thing for your image and for PR reasons, how about we do the right thing for the consumer? Those who helped get you where you are? How about that? Because whether or not you agree that the UFC is legally obligated to give a refund (which we will soon find out when this precedent is said and done), I’m willing to bet that everyone reading this would agree that the RIGHT thing to do would be to offer a refund for those who paid to see Jon Jones. So which is it, UFC? Are we about doing the right thing or aren’t we? Let’s not stop short at the consumer when it comes to doing the right thing. You wanna pull him from the card? Great. Where’s my money? Because this concept may seem lost to Dana White and Lorenzo Fertitta, but some people actually DID pay to see the best fighter in the world. I have written to and reached out to the UFC weekly since the announcement of Jones being pulled from UFC 187 in attempts to get my refund. I have not received so much as a response. This letter is not an attempt at attention or a cheap opportunity to defame the UFC. Clearly, I am a huge fan of the product. It is a last resort to get my refund before drastic measures are taken. If May 23rd comes around and I still have not received my refund, I am not going to this event. The only place I am going is to a courtroom to get my refund. And if anyone else, whether it be a Jones hater, supporter, or ANYONE who paid to watch the best in the business compete, EVEN IF YOU AGREE WITH HIM BEING SUSPENDED, IF YOU PAID TO SEE HIM, YOU DESERVE A REFUND. You can join me in bombarding the UFC with e-mails requesting a refund, and more importantly, you can join me in a group lawsuit on behalf of consumers who are not being considered if this request is not met. If you are with me, then my advice is to not attend this event, otherwise you will have no case. Having said all of that, I am more than prepared to go it alone in a traditional small-claims lawsuit. Either way, this cannot be tolerated. To tolerate this would set a very dangerous precedent where main events can be changed AT ANY TIME on the whim of the promotion due to PR pressure or any other arbitrary reason. Screw that noise. If you are going to change the main event and remove the main attraction, the guy had better be injured or locked up. But to have both the LAW, specifically the judge who lifted traveling restrictions, as well as the athletic commission allow the fight to go on as scheduled, and you CHOOSE not to hold the fight, then you need to CHOOSE to give the consumers who paid to see the main attraction their money back. And if you don’t, hopefully a courtroom that sees the danger of this precedent will take the choice out of your hands, the law into theirs, and the refunded money into the consumer’s. You do have the law on your side. Have you been advised by an attorney? Any refund request, especially for those who purchased tickets before April 28, should be honored.